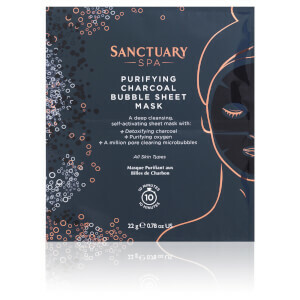 Achieve a smoother, more refined complexion with Sanctuary Spa Charcoal Bubble Sheet Mask; a deep cleansing, ten minute treatment for all skin types. Fortified with detoxifying Charcoal and purifying Oxygen, the self-activating mask forms tiny bubbles upon contact with skin to help dissolve dirt, grime and pollution, without stripping moisture. Skin looks clear and fresh with a healthy glow. 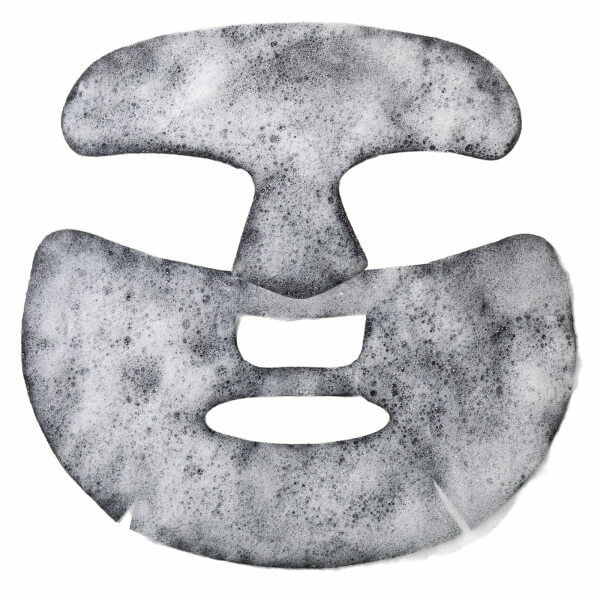 Place the mask onto clean, dry skin and leave on for 10 minutes. Remove the sheet mask and massage your face with the remaining bubbles. Rinse off with warm water and follow with your favourite moisturiser. Water (Aqua), Dipropylene Glycol, Glycerin, Methyl Perfluorobutyl Ether, Methyl Perfluoroisobutyl Ether, Disodium Cocoamphodiacetate, Cocamidopropyl Betaine, Sodium Chloride, Betaine, Butylene Glycol, Paeonia Suffruticosa Root Extract, Centella Asiatica Extract, Sodium Polyacrylate, 1,2-Hexanediol, Hexylene Glycol, Xanthan Gum, Chamomilla Recutita (Matricaria) Flower Extract, Glyceryl Caprylate, Fragrance (Parfum), Ethylhexylglycerin, Disodium EDTA, Citrus Paradisi (Grapefruit) Fruit Extract, Origanum Vulgare Leaf Extract, Chamaecyparis Obtusa Leaf Extract, Salix Alba (Willow) Bark Extract, Citrus Aurantifolia (Lime) Fruit Extract, Citrus Medica Limonum (Lemon) Fruit Extract, Pyrus Malus (Apple) Fruit Extract, Citrus Aurantium Dulcis (Orange) Fruit Extract, Vitis Vinifera (Grape) Fruit Extract, Lactobacillus/Soybean Ferment Extract, Portulaca Oleracea Extract, Scutellaria Baicalensis Root Extract, Cinnamomum Cassia Bark Extract, Phenoxyethanol, Limonene, Hexyl Cinnamal, Linalool.